Typically, when people are in the court system they want their cases heard as quickly as possible. But asylum requests are different. Building an asylum case usually involves the long and daunting task of gathering evidence from other countries. And here in South Florida that often means developing regions like Central America. So lawyers usually expect at least a few months if not a year or more to prepare. Crumrine works for the non-profit Americans for Immigrant Justice (AIJ) in Miami. Her client is a 35-year-old Honduran woman who says for years she’s been raped and even shot by a high-ranking police officer. (One bullet hit her ovary and forced her to have a hysterectomy, according to Crumrine.) Honduran police are notorious for such abuses. So, fearing for her life, the woman came here. But Crumrine worries whether she can prove the woman’s case in 30 days. Crumrine and other South Florida attorneys say they’re getting less time from judges this year to prepare asylum cases. And their fear is that this may be a trend. The Trump Administration is already significantly speeding up the deportation process for undocumented immigrants. Now lawyers wonder if it also intends to accelerate asylum cases – something they say would put asylum applicants at a real disadvantage. Ortiz is also concerned because on average immigration judges in South Florida already grant fewer than 30 percent of asylum requests, compared to more than 40 percent nationally. “Time is one of the few things that was on the side of the [asylum] applicants,” says David Abraham, an immigration law expert at the University of Miami law school. Abraham cautions that undocumented immigrants and asylum seekers can’t expect the same level of due process that U.S. citizens and legal residents enjoy. Still, if judges are accelerating asylum cases, "it certainly tips the scales against the asylum applicants. Federal immigration judges are not authorized to speak to the media. But in a statement to WLRN, the Executive Office for Immigration Review (EOIR) – the branch of the Justice Department that oversees those judges – said it has issued no directive to accelerate asylum cases. The EOIR also noted the judges are still granting more than the minimum time the law requires them to give asylum applicants. And immigration courts in general are chronically underfunded, understaffed and strained by burgeoning case loads. 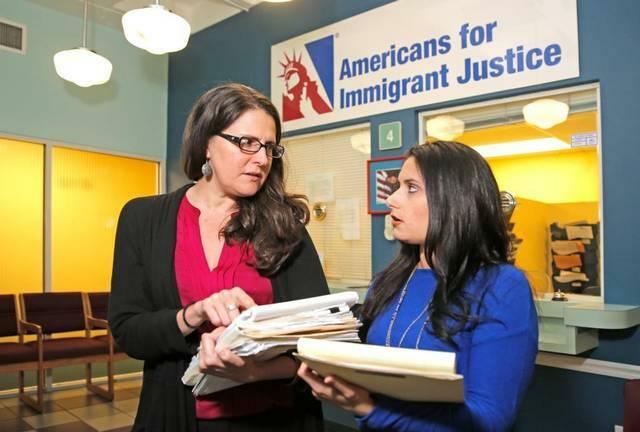 Michelle Ortiz of Americans for Immigrant Justice (left) consults with an immigration attorney at the AIJ's Miami offices. Even lawyers like Crumrine – who just got a couple more weeks for her Honduran asylum case – acknowledge that. “Honestly, I think immigration judges have an impossible job,” she says. Immigration attorney Rachel Diaz agrees. But she was still taken aback this month when a judge at the federal immigration court in Miami gave her one month to prepare an asylum case for her Guatemalan refugee client. This month the Justice Department announced it’s sending scores of new immigration judges to a dozen cities including Miami. Their main task is to speed up the deportations of undocumented immigrants charged with crimes. But immigration lawyers will be watching to see if they also speed things up for asylum seekers who’ve gone through horrible things – but need time to prove it.